"Discontent is the first necessity of progress. Show me a thoroughly satisfied man and I'll show you a failure." What is the first word you think of when you hear the name Albert Einstein? Most people answer with a resounding, “Genius!” Never will you ever hear the word, “Nut.” Seldom will anyone ever hear the name and not recognize it as one of the greatest minds to have ever lived. Most, however, perhaps feel that his genius was immediately apparent. Not so! We assume that early in childhood he had a recognizable gift. Perhaps, his parents immediately wisked him off to schools for the gifted. Everything he touched or did was incredibly easy and he breezed through life effortlessly on the wings of his genius. We imagine that to him problems were easily solvable, questions were easily answered, and we could only dream of ever having such a gift. In actuality, his life was far different. It is assumed he grew up humbly and his genius was not obvious. 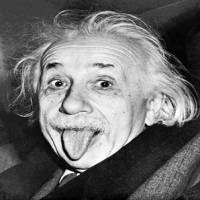 In fact, Einstein was unable to speak fluently until he was 12 years old. At school he was actually tormented by other children who commented he smelled of dill pickles and peanut butter, his hair was a mess, his clothes were disheveled, and he ate large quantities of paste. He would often act out in class by barking or snorting loudly which earned him the nickname Schweinhund, meaning “pig-dog”. He in turn exhibited other unruly behavior in the classroom. In one instance, he released two bats from his lunchbox. Seven students were injured in the panic as the bats flew through the classroom. His classroom behavior, coupled with his never-ending imagination and exploratory mind, caused Einstein to wonder about the laws of physics. In fact, in 1886, as young Albert was hurling a spitwad at the back of his classmate’s head, he began to ponder the laws of physics as it applied to the flight of his projectile. Einstein felt at that moment that he had to know more and by age 16, he had mastered differential and integral calculus to further comprehend the dynamics of his flying spitwad. His strides in his academic achievements did not prevent him, however, from getting expelled from the Rotterdam Academy for releasing into the classroom a rabid skunk, again concealed in his lunchbox. Kicked out of academia, Einstein went on the road to pursue life as a musician and a standup comic. Not many know that Einstein was a violin virtuoso. He performed solos and was the coveted first chair in a symphony. But, he became so bored conforming to the strains of other musicians, he would often improvise and as a joke insert quips like “She’ll be Coming Around the Mountain” into the middle of performances. Even playing it backwards on occasion. Though the audience found it hilarious, the Maestro didn’t. He was sent packing. It didn’t take him long to find his way to New York as a Vaudeville comedian. His physical comedy captured the hearts of the audience. He was a huge success. But again, his success was thwarted as he was busted for stealing over 200 souvenirs from the celebrities with whom he worked. Albert Einstein was a kleptomaniac and subsequently shunned from the vaudeville community. With his hopes as a performer in shambles, Einstein had little left to do, but return to his “academic arts”. In 1896 he applied to FIT, New York’s Fashion Institute of Technology. He failed the entrance exam several times before finally passing it and being admitted. He seems to have excelled in his years at FIT, but a disagreement with a professor over an algorithm to calculate optimum lapel width left him closed to future opportunities with the University. He returned to Europe. It was here and then that he finally became the Albert Einstein we’ve come to know, love, and read about. Where in the annals of history do you read of Albert Einstein, the slow learner, the class clown, the problem child, the loser, the weirdo, the musician, the comedian, the kleptomaniac, the failure, the nut? We know him simply as Albert Einstein, The Genius. Where and how long has your talent or genius laid hidden? Have you believed the words of others or taken to heart your past failures and experience to decide who you are today? How much more to you really is there? Find out TODAY! Look what happened to Paul Potts. Dr. Suess was rejected over 28 times for his first book . . . Bankrupt and fired for having "no creativity", Disney became a household name for kids and adults alike. Einstein was not always known for his genius. His brilliance did not clearly surface until he failed many times. Cooking since he was 6, Col. Sanders did not open his 1st KFC until he was 65 years old, but had 600 franchises by age 75. Ray Kroc– Over 50 Billion Hamburgers Sold! From a humble salesman to pioneer of franchising and founder of the most successful fast-food franchise ever. More than a few blunders + 1000 failed attempts inventing the lightbulb = The most prominent inventor of our time. Thoughts on maintaining a positive mental attitude. A run down (just a paragraph each) on some of the most famous individual's starts and finishes. Learn from some of the most successful and accomplished leaders of today who faced incredible challenges, unbelievable odds, and failure after failure.